One of your worst fears is realized: You fell face first onto the concrete, and you felt that front tooth break. Panic mode ensues. What the heck are you going to do now? Don’t panic, we’ve got some answers for you. There are all types of dental emergencies and most of the time, the answer is going to see a dentist as soon as you possibly can. However, until you get to the dentist, there are a few things you can do to ease the pain. #1 You Broke or Chipped Your Tooth. This is easily one of the most painful emergencies. You’re going to want to call the dentist as soon as possible. Meanwhile, rinse out your mouth with warm water, and try to keep the tooth if possible. Also, try to put an ice-pack on it in transit to the dentist. #2 You Knocked a Tooth Loose. So your tooth is loose, but didn’t get knocked out. That’s good news (even though it hurts). The dentist may be able to save your tooth. Take some over the counter painkillers, put some ice on it, and get to the dentist as soon as possible. #3 Broke or Lost Your Crown or Filling. Oh boy, that’s no fun. Hopefully, you didn’t swallow it. If you did, don’t worry, you’re not going to die. Try to keep the crown or filling if you still have it. Your tooth is going to be very sensitive to anything going into your mouth. That includes air. You can use clove oil to try to soothe the sensitivity as well as get some dental cement from a local drug store. Once again, get to the dentist as soon as you can because you’re likely in pain. 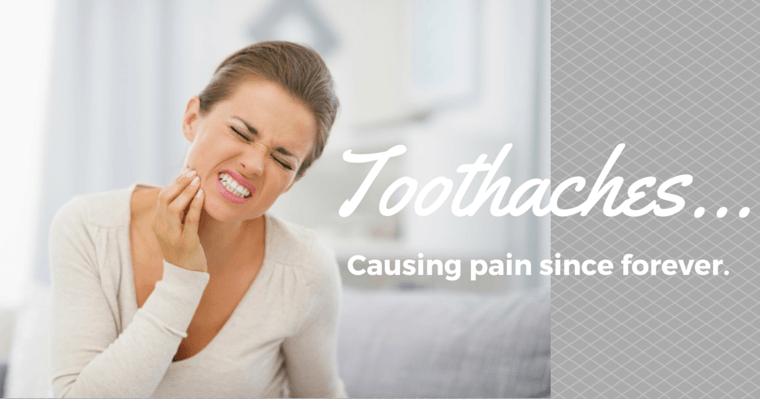 Toothaches can be the symptom of a lot of different problems. The best thing to do is start with rinsing out your mouth with some warm water. Then try to gently floss around the tooth to make sure no food is hanging out around there. If it persists, you’re going to need to take a trip to the dentist. #5 Something is Lodged Between Your Teeth. When something gets stuck between your teeth, it can become rather painful and could lead to infection. It’s got to come out pronto. First, try to get it out with some floss. If that hurts too much, you could also try something like Soft Picks for a gentler approach. If all else fails, you’re going to want to call the dentist. #6 Sudden Swelling in Your Mouth. This could happen for a number of reasons, but is potentially very serious. You may have an abscessed tooth. Abscessed teeth are no joke. The infection can spread quickly, and since your mouth is in your head where your brain resides, you’re playing with fire if you let this one go. There’s really nothing you can do other than getting to the dentist as soon as possible. Unless, that is, you want to pull a Cast Away. But that method is highly frowned upon and should only be used if stranded on a desert island. #7 You Broke Your Braces. Braces have a lot of moving parts. Sometimes those moving parts break. First, if they break, call your orthodontist to get in as quickly as possible. If a wire breaks, you’ll want to get it somewhere where it isn’t poking you. If there’s no way of moving it to a place that isn’t hurting, use some orthodontic wax to cover it until you can get to the orthodontist. If it’s a band that loosens, salvage it and set up an appointment with your orthodontist to have it replaced or re-cemented. #8 You Bit Your Cheek or Tongue. This happens all the time when you’re eating, chewing gum, or just not paying attention. Most of the time it’s not too much of an issue, but there can be circumstances that make it more traumatic. In that case, the first step is to try and stop the bleeding. Rinse your mouth with some saltwater, then use a piece of gauze to put pressure on the wound. If you can’t stop the bleeding and your dentist is unavailable, go to the ER. They may need to take a look at it. A broken jaw is no fun. Basically, there’s nothing you can do for this other than take some over the counter painkillers and put some ice on it until you can get to the ER. Wisdom teeth are tricky business. They seem to come whenever they please, and when they do, they can easily wreak havoc. Pericoronitis is an infection that can occur when your wisdom teeth don’t come in properly. If you get it, you’ll know because of your irritated gums in that area, as well as possible bad breath. See a dentist as soon as possible to get this one figured out. What Can You Do to Prevent Dental Emergencies? Wear a mouthguard: If you’re playing any kind of sport, it’s going to be a good idea to keep those teeth safe with a good quality mouthguard. Avoid chewing damaging foods: Think ice, popcorn kernels, caramels, that sort of the thing. They can easily cause you teeth to break. Brush and floss: Do it! Keep your mouth healthy. See your dentist regularly: It’s not always going to be your favorite thing, but your dentist is your best bet for keeping your teeth in great shape. So there you have it, the worst of the dental emergencies. Have you had your own experience with a dental emergency? Let us know about it in the comment section.